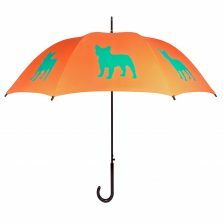 Scottish Terrier Dog Umbrella - a Scottie Umbrella from Umbrella Heaven! 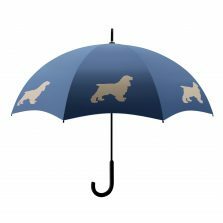 Looking for a Scottish Terrier dog umbrella? Check out our superb Scottie Umbrella for lovers of Scottish Terriers everywhere. 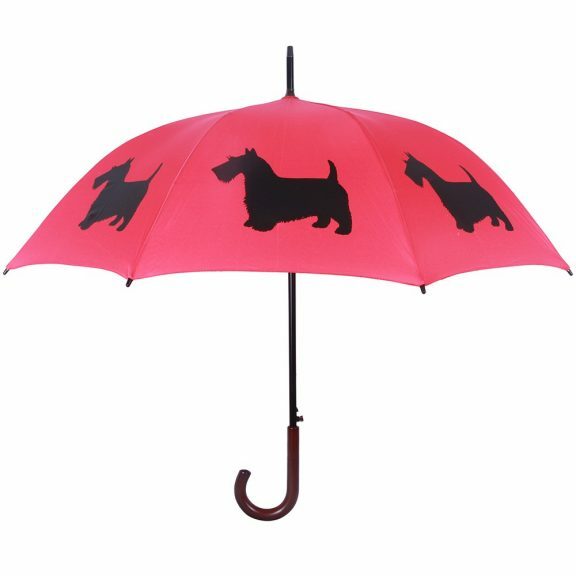 The perfect dog walker’s umbrella especially if your dog is the beloved Scottie! 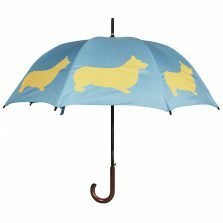 Looking for a Scottish Terrier dog umbrella? Are you a fan of the sublime and super Scottish terrier? Then you’ll love this striking Scottish terrier printed parasol. Its design features an impressive 95 cm, striking red polyester canopy, with terrific Scottie silhouettes in bold black. At 86 cm long, this walking style Scottish terrier umbrella really is something else. With 8 strong, flexible fibreglass ribs and a handy auto-open feature it also has a 14 mm steel shaft that will stand up to the wind and the rain. 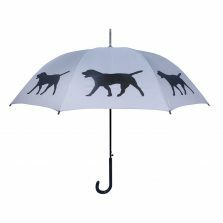 In addition this stylish Scottie dog brolly has a nice chunky polished wood crook handle, for comfort and style. This beautiful brolly really makes the perfect gift for any Scotty lover! Not the right animal for you? Check out the rest of our range of animal, bird and butterfly art umbrellas!